You wouldn’t usually expect an IT/printing company to be a pivotal Corporate Social Responsibility (CSR) leader, but at the hands of Chairman and Managing Director Dr David Cooke, Konica Minolta Australia are set to change all that. We sat down with David to bring you this exclusive piece to delve into his expertise in ensuring a socially responsible supply chain and the benefits of CSR, which forms a basis for the Conscious Capitalism four tenets, for business. With over 25 years’ experience in the IT industry, David is proof of the value in doing business with purpose and ethical responsibility as driving forces. At the invitation of Conscious Capitalism WA he will be taking part in a keynote panel discussion at the Social Impact Summit on the 20th July in Perth, titled ‘Doing Business, Doing Good’. David has always had a strong interest in non-for-profits as an established business person. In 2005 he commenced his Doctorate of Corporate Social Responsibility looking into the benefits for business of charitable giving and the implementation of programs to give back to society. At a time when charitable giving was already well established, Cooke’s focus as part of this research was to find out the ‘why’ behind large corporations implementing CSR programs as part of their business practice. It was through this study that David confirmed a concrete understanding of the significant return on investment (ROI) of CSR, as well as the societal expectation placed on businesses of today to act in an ethically responsible manner. One of the elements that David focused on as part of this study was the importance of where the corporate giving sits within an organisation, which he concluded holds significant telling of where a business values their impact. In the case of Konica Minolta, the area of the business that provides their social responsibility funding is the ‘People and Sustainability sector’. Research has shown that having purpose is now one of the key desires people have when looking for jobs, both in Australia and worldwide. David explained the positive impacts he has seen at Konica Minolta through working with a purpose in terms of staff engagement, recruitment and retention. “At job interviews to join Konica Minolta in recent years, when applicants are asked why they want to work here, their response often includes positivity around what the business does and wanting to be part of an organisation that is consciously doing their part to make a positive change”, David recalls. ”The positive growth in our business is a by-product of our focus on creating a more engaging work environment which was a response to our staff survey where employees asked for more Purpose in their work day,” he adds. David has seen this benefit for not only his staff, but customers as well. “We are committed to socially and environmentally responsible procurement and have set high standards for the way we do business, so our customers know we can be trusted, ” says David. On the topic of modern slavery, David discussed the fact that there are currently 47 million slaves worldwide, the highest it’s ever been in human history. He also highlighted the relationship between business and modern slavery, which is fueled by cheap labour practices. Cooke asserts that the key element contributing to this problem is a lack of awareness and knowledge on the issue of modern slavery. Konica Minolta has helped champion the Modern Slavery Act which was introduced into Parliament on 28th June 2018 and should become law later this year, making it compulsory for Australian businesses to investigate their suppliers and work to stop the use of modern day slavery in Australian business. This Bill will impact all businesses in Australia with a turnover of $100 million and above per year. Cooke explained the confusion some people had with this, questioning his work to implement additional regulation and ‘red-tape’ into his organisation and many others. According to David it is the only way to move forward with businesses accepting the responsibility to help combat the issue. David also discussed the importance of the work of Andrew Forrest, Chair of the Walk Free Foundation, as a true champion in the work to abolish modern slavery. “As well as our on-going community partnership programs, we’re dedicated through our efforts and influence to improve the quality of life for people affected by modern slavery or unfair work practices throughout the supply chain”. Cooke’s first move when implementing the conscious supply chain strategy at Konica Minolta Australia was to employ a full-time Ethical Sourcing Manager to develop and run investigations into the organisations that supply to Konica Minolta. He explained the importance of engaging with suppliers productively to help them and work with them, instead of bashing them up in terms of issues that arise. As Konica Minolta is part a large international parent company, the large number of suppliers makes it difficult to ensure exactly where every element of their production is from, although Konica Minolta and their suppliers have been working together to ensure ethical practice of suppliers. Hire a dedicated professional in the area or speak to an expert in the field to support the movement. As well, work to develop practices around ethical sources and then implement these strategies. Start by looking at your biggest suppliers, if not by spend then by high risk area (such as electronics, textiles/manufacturing industries). A good place to begin working from is finding out how much of an item is made by them or finding out where their supplies are from. By making your intent clear and transparent with each supplier, you can start to help them with the process of producing ethically and consciously. Using companies that are already an ethical brand as part of your supply chain can be a beneficial starting point in the process. Begin to meet and stay regularly connected with others in the industry working towards the same goal. 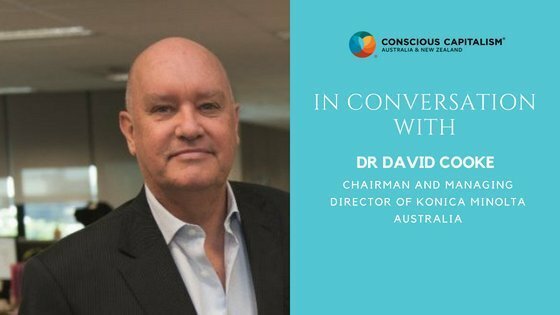 Western Australians can hear David’s views first hand at the Social Impact Summit on 20th July 2018 in Perth. Click here to book tickets. Discover more on how CSR fits in the total Conscious Capitalism movement here. Conscious Capitalism involves an integrated, cohesive and impactful approach to business including Purpose, Stakeholder Orientation, Conscious Culture and Leadership with a focus on using business to improve humanity. More about the movement here.